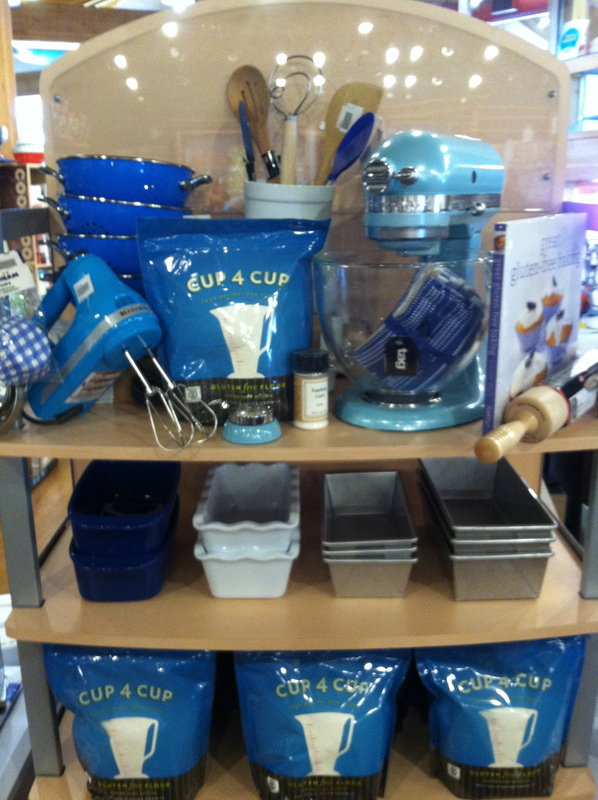 As a person who is normally gluten-free, I am really excited to be carrying our newest product: Cup4Cup Flour. Developed in conjunction with one of my heroes, Thomas Kellor and The French Laundry, this gluten-free baking mix has the ability to stand in as an exact replacement for all-purpose flour in most of your favorite recipes with no additional work or worry on your part. It is not completely allergen free because it contains cornstarch and powdered milk, but it is convenient and delicious for individuals that are simply eliminating gluten. This flour performs beautifully in cookies, cakes, muffins, quickbreads, pancakes, and biscuits but I wouldn’t recommend it for use in conventional bread recipes without further research on my part. 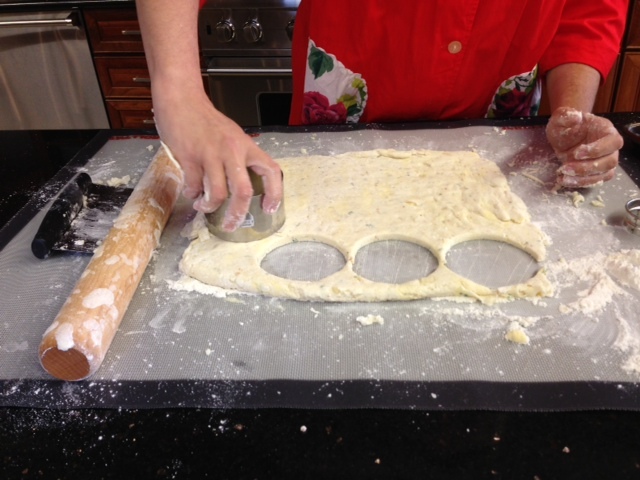 If you are making yeast angel biscuits, however, go for it. We are also carrying the pizza mix that comes with the yeast and yields 2 large crusts. The most beautiful part? Cup4Cup’s “gluten-freeness” is virtually undetectable…no weird aftertaste, off flavor, or gummy consistency AND you never have to add xanthan or guar gum. I wrote this biscuit recipe specifically to highlight Cup4Cup’s versatility and performance, as well to wean the public off of a tube biscuit addiction. If you want, use regular all-purpose flour and this recipe should still be sublime. Preheat your oven to 400 degrees. Gather all your ingredients and supplies: pastry cutter or forks, wooden spoon, two lined baking sheets (with parchment or Silpats), biscuit cutter of your choice, Silmat­—or clean rolling surface—and rolling pin, flour for rolling and dusting, pastry brush, timer, clean kitchen towel. 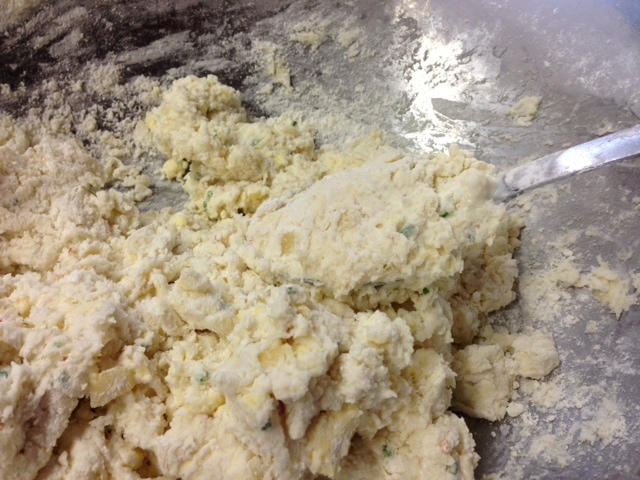 In a large mixing bowl, combine the flour, baking powder, baking soda, salt, sugar, and chives. 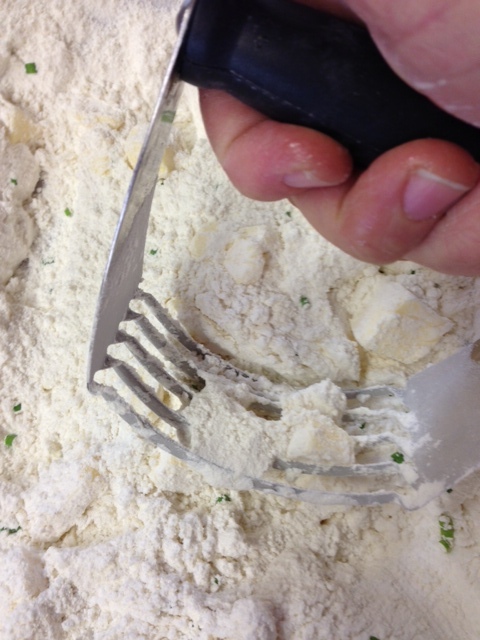 Cut in the butter with your pastry cutter or forks and process until pea sized chunks remain. Stir in the grated cheese and pancetta or bacon. Add the milks and stir briefly, don’t mix completely. 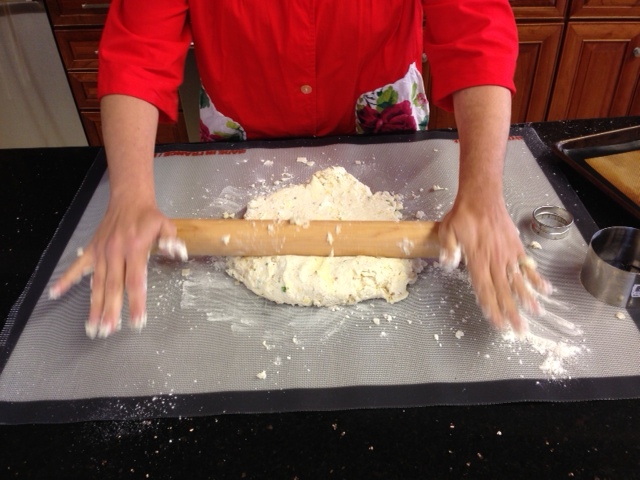 Turn out onto your prepared rolling surface and knead a few times. Flatten and sprinkle with flour and roll into a 1-inch-thick rectangle. Fold the sides in toward the middle and then fold in half. 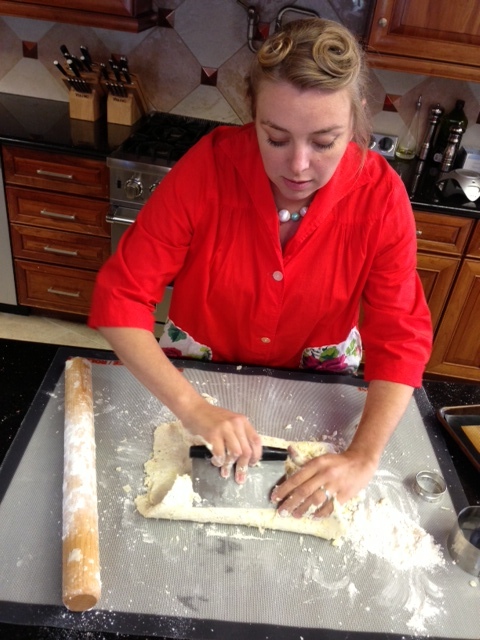 Sprinkle with flour if needed, and roll into another 1-inch-thick rectangle. Fold into thirds and roll out again. 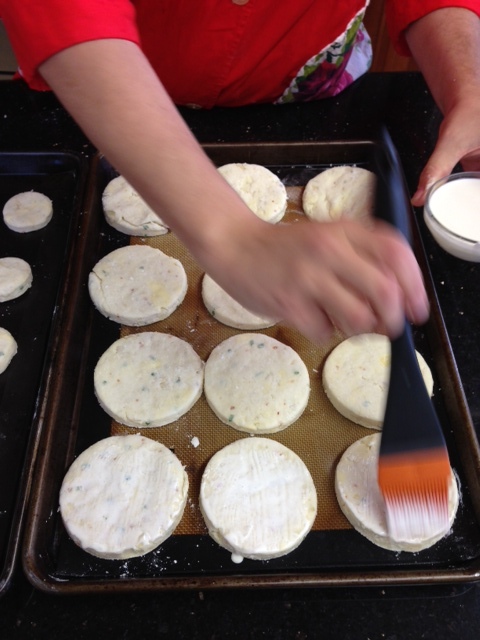 Cut with a biscuit cutter and place on your prepared baking sheets. Brush the tops with cream and bake for 14-18 minutes in a 400-degree oven, switching the baking sheets half way through the baking time. Cool on a rack and enjoy! First, ready your space. This includes making sure you have adequate rolling room, and that your dirty dishes are washed and put away. Gather all of your ingredients. Then, measure them out and put the excess back away. Preheat your oven and gather all of the tools you need: baking sheets, rolling pin, side towel, mixing bowl, wooden spoon, pastry cutter, etc. This process is called mise en place in French (meese on plaws) and means “everything in its place.” To a professional chef, mise is everything; it helps provide speed, clarity, and process to each undertaking while eliminating unnecessary steps in cleaning and cooking. Hate me yet? I suggest wearing an apron or smock when in the kitchen & tying the apron strings in the front so you can hang a towel or two within reach of your hands. Have extra rolling flour on hand within reach just in case so you aren’t panicking with gooey hands and trying to open a bin with your teeth and elbows at a crucial moment. 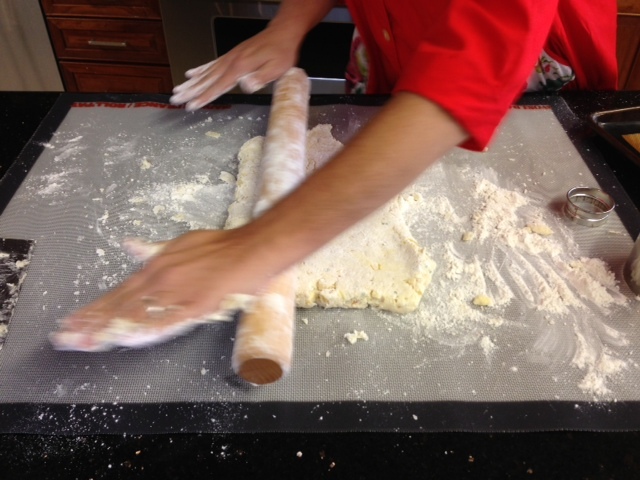 Lightly flour your rolling surface. Mix your dry ingredients and herbs in a large mixing bowl with a wooden spoon. Cut in the ice-cold butter with an old-fashioned pastry cutter or two forks or with your hands (dip your hands in ice water first and towel them off). We want our butter chunks to be incorporated but remain the size of small peas or pearls suspended individually in the flour. Cut in the cheese briefly. Add the milks and give everything a quick stir with the wooden spoon. 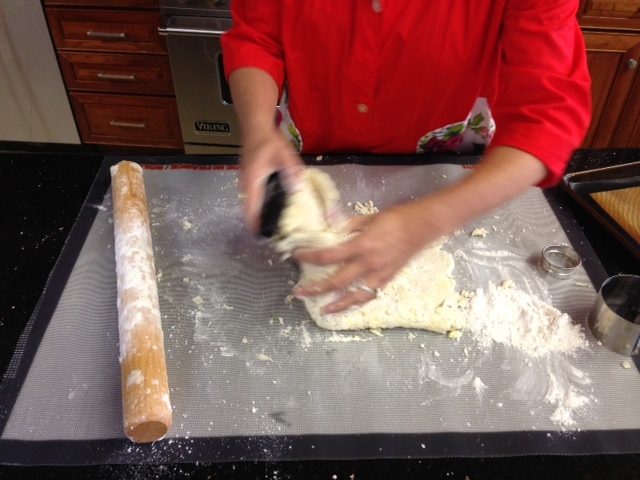 Don’t over mix because you will be doing a knead and 3 rolls, not just one. The extra rolling steps help create fluffy layers in your biscuits, similar to puff pastry or laminated doughs, but without the extra chill time. 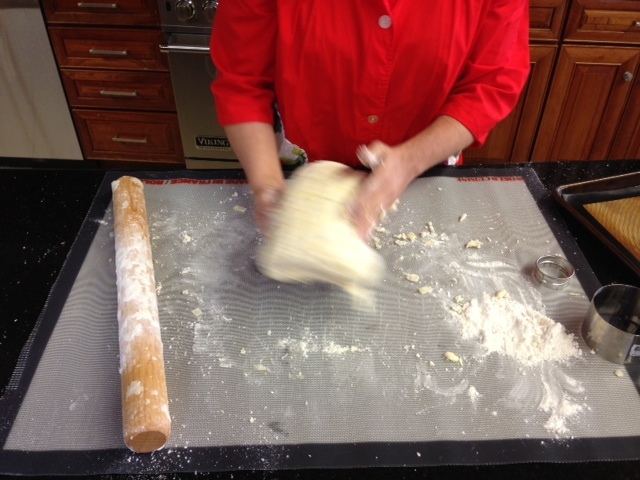 Turn the dough out onto your lightly-floured counter or mat and give it a few kneads. It will be sticky and your hands will get gooey, which is why I recommend having clean towels at hand. Sprinkle with flour and roll out into a 1-inch-thick rectangle. Fold the sides in towards the middle point, then close it like a book. Roll that out into another 1-inch-thick rectangle. Fold that one into thirds, sprinkle with flour and roll out in to the final 1-inch-thick rectangle. 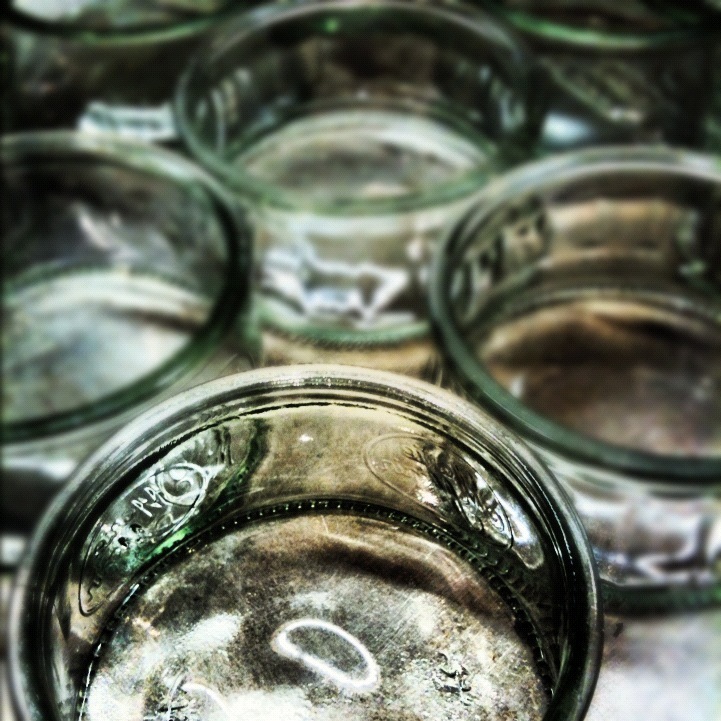 Cut with a biscuit cutter or juice glass rim and place on your prepared baking sheets. 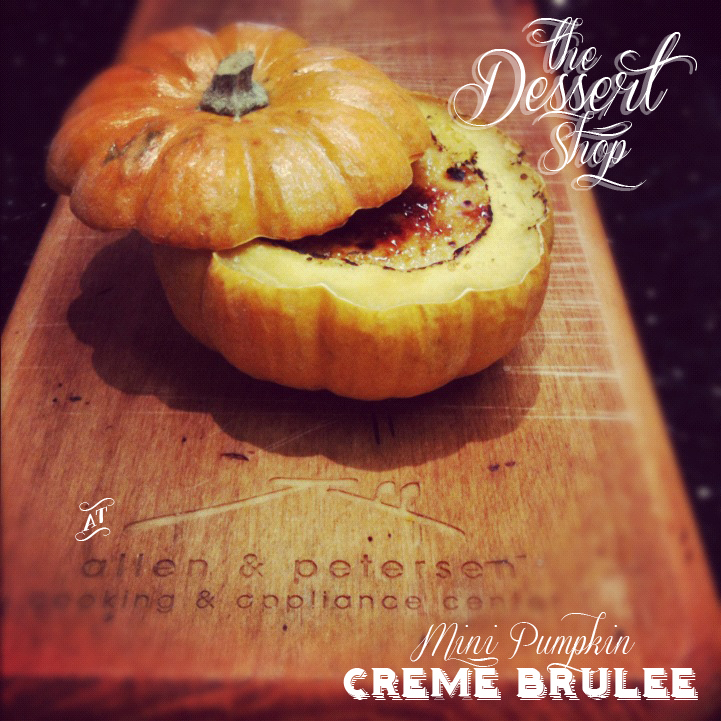 Brush them with cream and bake. 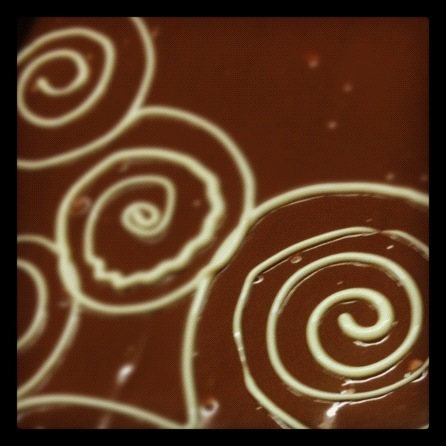 I recommend a 375-degree convection setting for multiple sheet trays, or 400-degrees in a conventional oven and switching the baking sheets half way through the allotted baking time. Once you get your biscuits in the oven, PLEASE don’t open the door to peek. There is a very special process happening in the first half of baking called “oven spring.” This is when your leaveners are working their hardest and the melting butter is popping steam pockets into flaky layers. I recommend setting a timer for 7 minutes and cleaning out your junk drawer or washing your dishes. When that timer goes off, switch your trays. Set the timer again and remove the biscuits when they are done, placing them on cooling racks for at least 5 minutes before devouring. Serve with herb butter, red pepper jelly, as a BLT, with eggs, gravy, ham and cheese, cream cheese, etc. 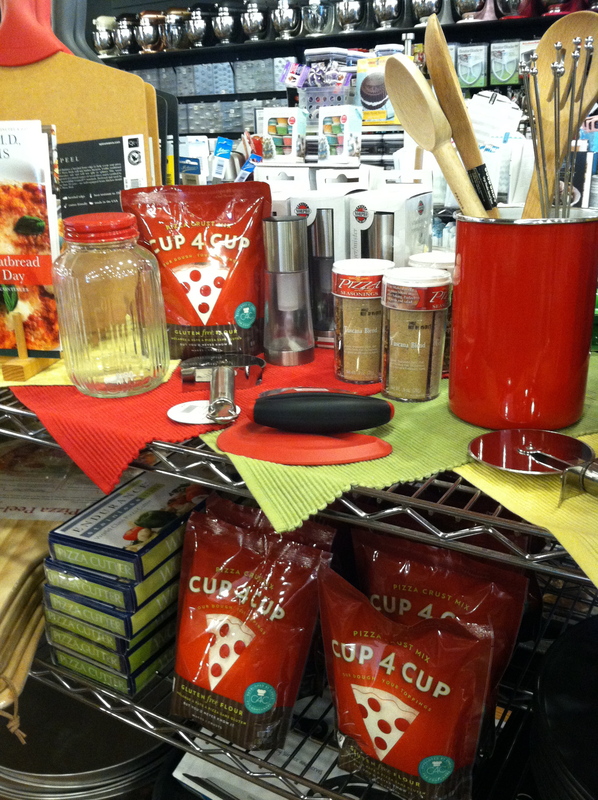 Cup4Cup is available at Allen & Petersen: 3-lb.-bag $16.99 or the Pizza Dough mix: $8.99. 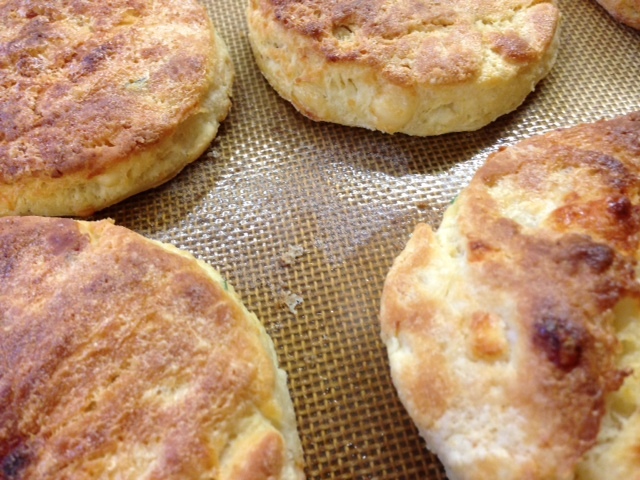 Most of all, this recipe is just a guideline, but the instructions are specific for a good reason: you now know the “biscuit method” and you can thank me later! There's just something special about this dessert. Maybe it's the crack of the sugar when your spoon breaks through to all the creamy smoothness (it feels so decadent, like eating lobster or crab), or the crunch in opposition to the light vanilla infused cream. Maybe it's the magic of watching the sugar crystals bubble up and meld together, the love's labor of all those eggs and dairy, the fact that you get your own serving and can decide how you want to eat, no cutting or sharing- just the decision of "Do I eat a little crust with each bite, scoop under and get all the creamy goodness and leave the shell for last, or quickly crunch down the top layer and slowly savor the smooth yumminess one small spoonful at a time...?" 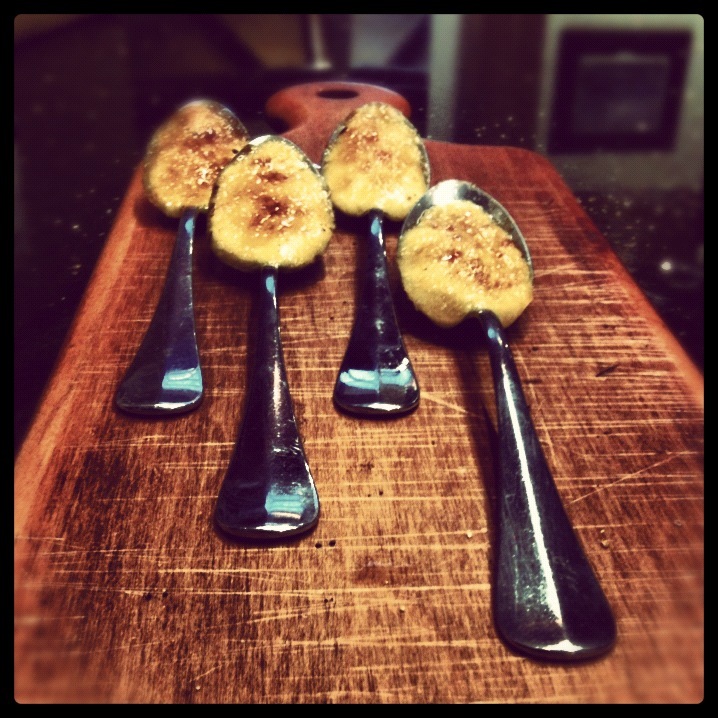 Whatever the particular draw, there's no denying it's deliciousness! we decided on the cutest little cup that the autumn season has to offer- the mini pumpkin, but only because acorn sized brulees would just be a tease. 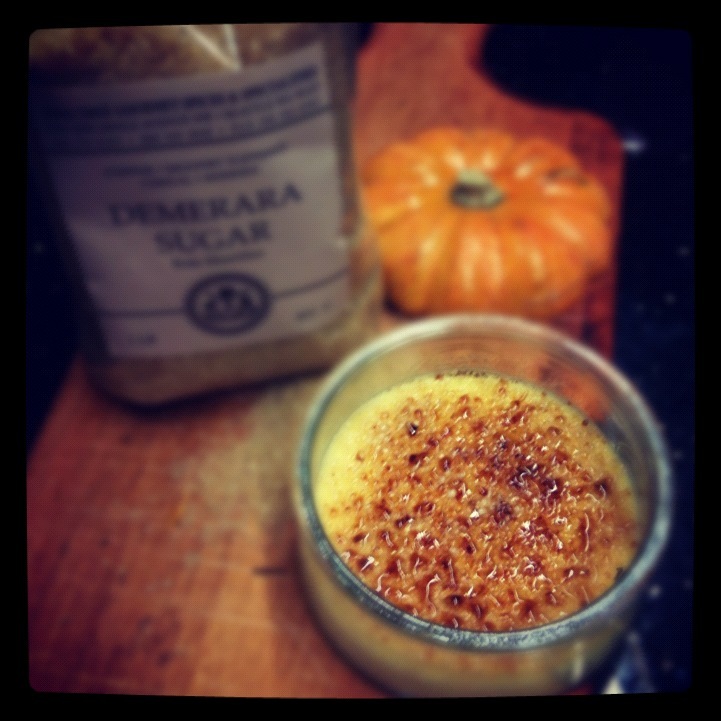 Through our trial and tests we did discover that some of the pumpkin acidity seeps into the creme, so we are using brown sugar to amp up the sweetness, not to mention the added depth of seasonal flavor. Also, we found that it's best to approach the pumpkin with the torch from above, that way there is less chance that your vessel will perish in flames, and will minimize too much smokiness or burnt edges. 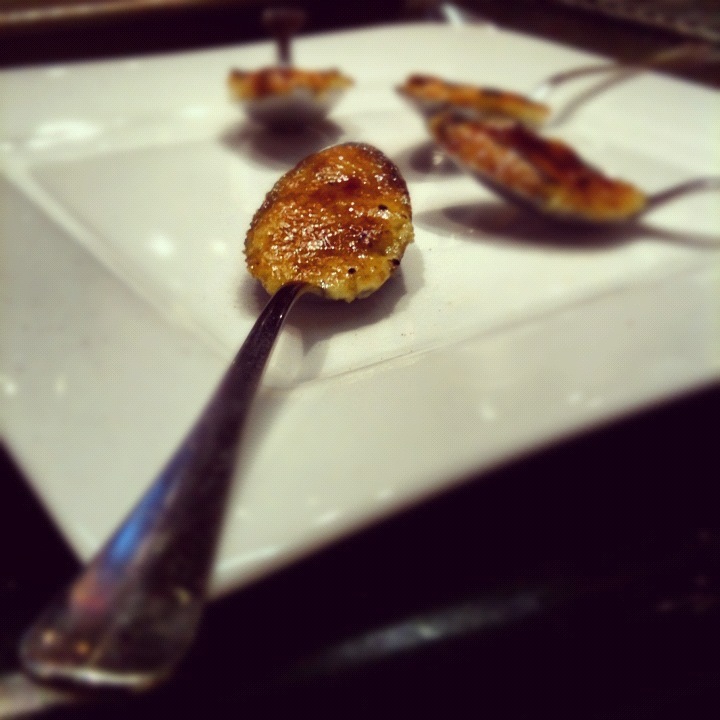 Our creme brulee was made with vanilla paste in place of a bean- because it eliminates the 20 minute infusion wait time, and the sugar we chose is Demerara Sugar from India Tree for its light carmely flavor and large crystal size. 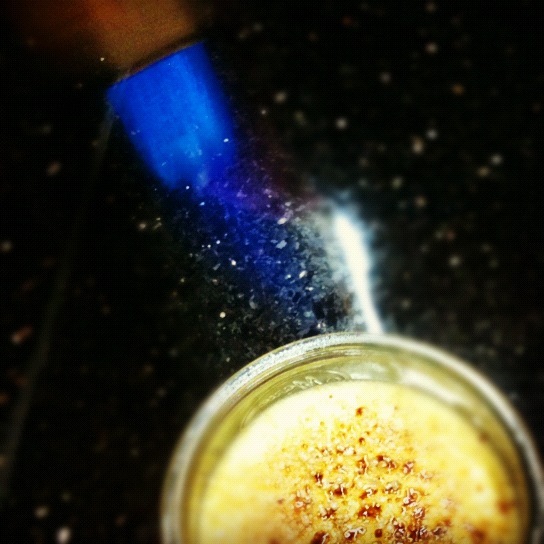 For torching, it's best to keep the flame low, approach from the top and slowly bring the flame down over the sugar, moving in small circular motions. Once you see the crystals start to melt, ease off and increase the radius of your circle. The ideal melting scenario is for the entire top to be bubbling in unison- that way no one spot gets too hot and you get a nice smooth uniform crust. You want to be sure that all the crystals liquify and get a little toasty without burning. My first attempt I went in hard and fast- with my torch at full flame. Needless to say, that one became 'mine' because it was definitely burnt on top, with crystals underneath... yikes. Start low and slow, but don't be afraid of a nice golden color, that's where the flavor kicks in! Also, if using glass, ceramic or stainless vessels, be sure to allow cool down time before trying to serve... again a lesson learned the hard way. If using a bean: Slice vanilla bean in two, lengthwise and run blade of knife down both open halves, scraping seeds from vanilla bean. Combine milk, vanilla bean seeds, scraped bean, and salt in a small saucepan. Place over medium heat until the milk is just below boiling. Remove from the heat and let stand for 10-20 minutes to allow the flavor of the bean to infuse. Strain the mixture through a coarse sieve back into saucepan. Discard the bean. Place the pan over medium heat, and return the mixture to a low simmer, remove from heat. If using paste: combine with milk and salt in small saucepan. Heat to a near boil on medium. 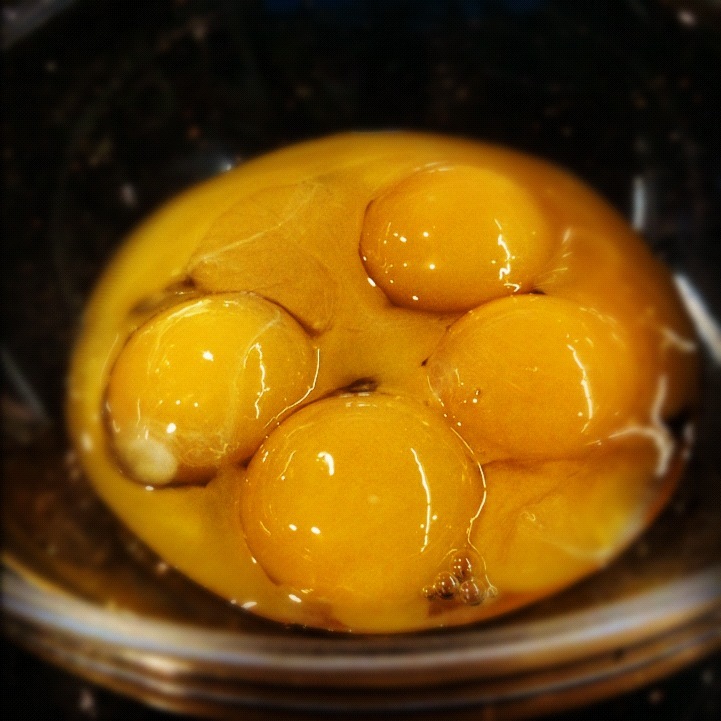 In a large heatproof bowl, whisk together the egg yolks and granulated sugar. 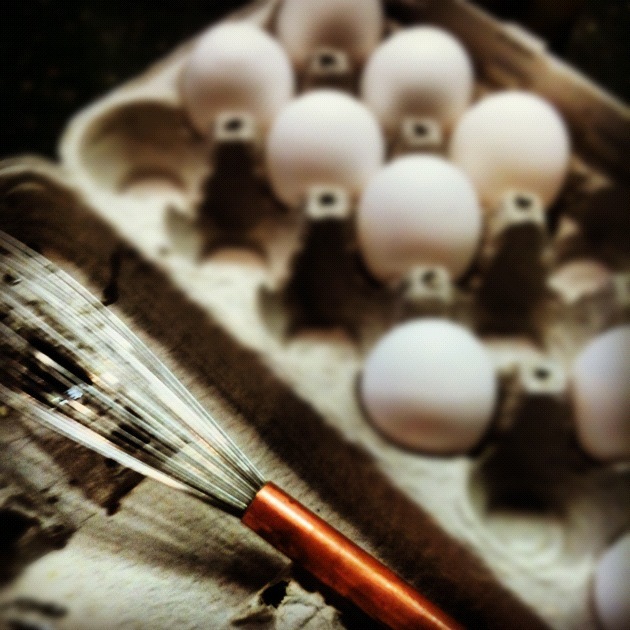 Pour a small amount of hot milk mixture into the egg mixture to temper the eggs, whisking gently. 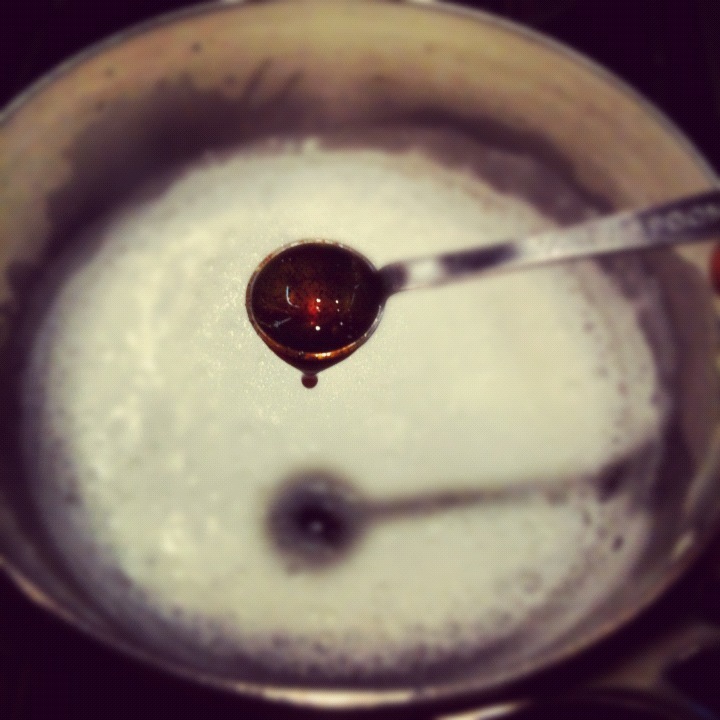 Stir in the remaining milk mixture, skimming off any bubbles that may form. When slightly cooled, stir in the cream. 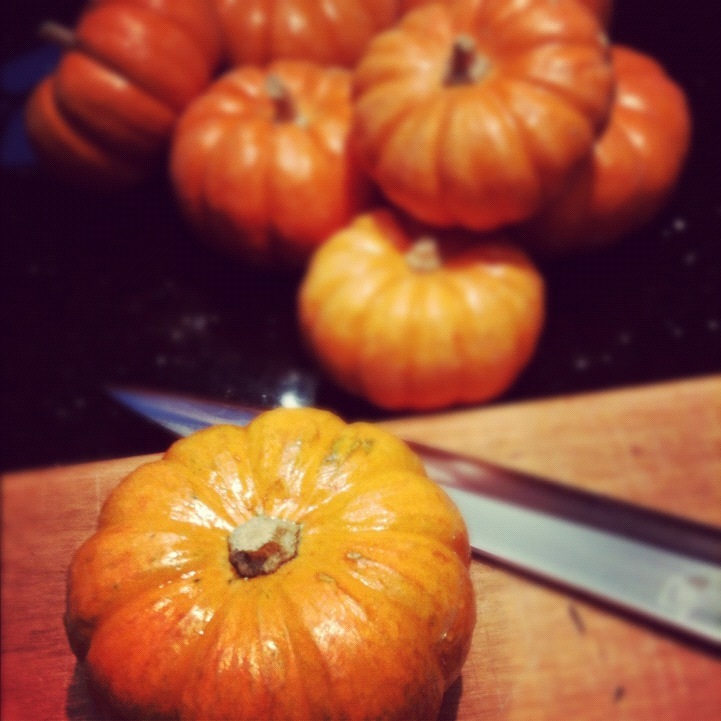 Wash and carefully cut tops from 8 small pumpkins. Use a spoon to hollow out cavity, scraping walls to less than half an inch. 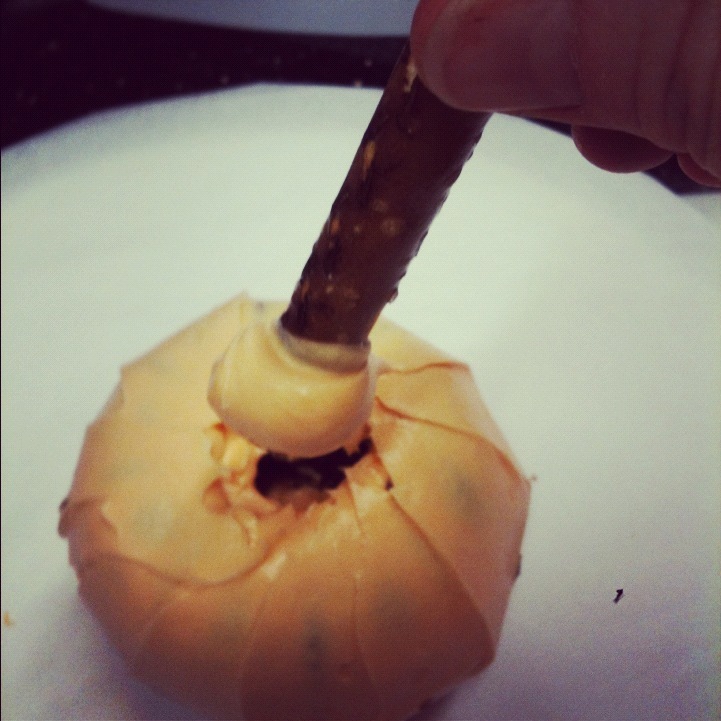 Place pumpkins in a baking dish and slowly pour the custard into each one, filling almost to the top. Set the baking dish in the center of the oven, then carefully pour in enough simmering water to reach halfway up the sides of the pumpkins. Be careful not to splash the custards. Bake 30-40 mins until centers appear nearly set when gently shaken. 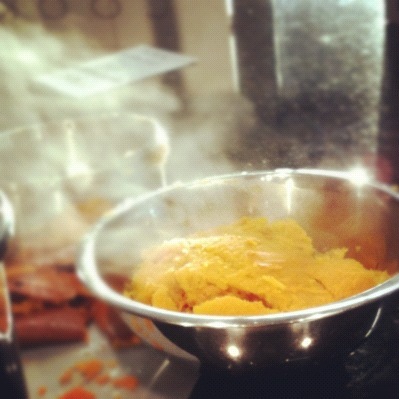 Carefully transfer pumpkins from the bath to a cooling rack, let stand at room temperature for 20 minutes. You may refrigerate up to 4 hours prior to serving. Gently blot the surface of the custards with a paper towel to remove any condensation. 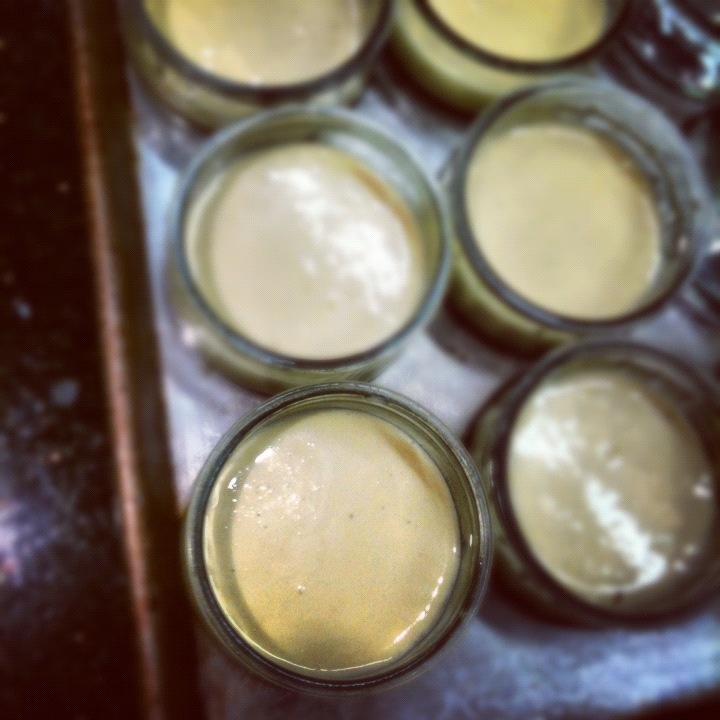 Sprinkle a very fine, even layer of sugar over each custard. Torch the sugar until lightly browned. Allow the sugar to harden, sprinkle a second thin layer of sugar over the first- paying attention to the edges- torch again and allow the final layer to harden. 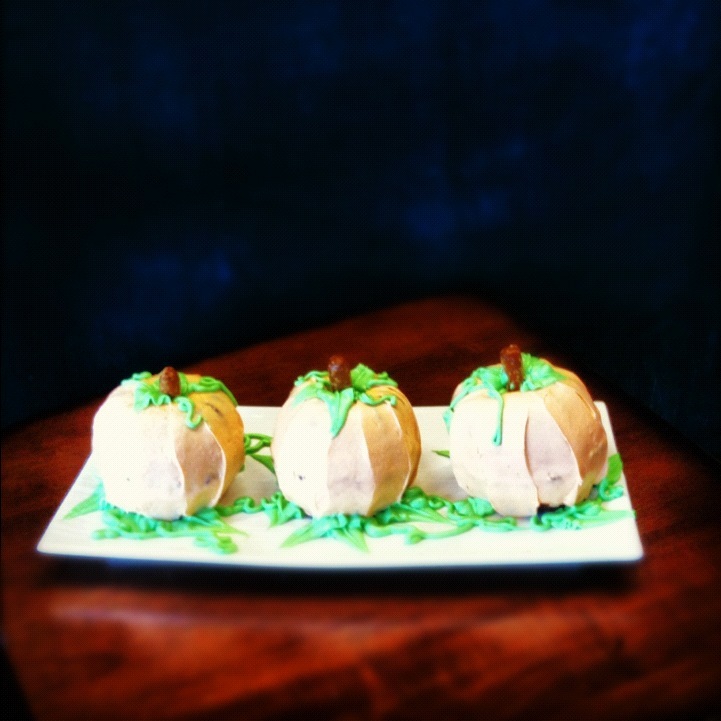 Serve with pumpkin ‘lid’. We decided just one bite wasn't enough, but if the whole plate was a serving, then that could be fun. 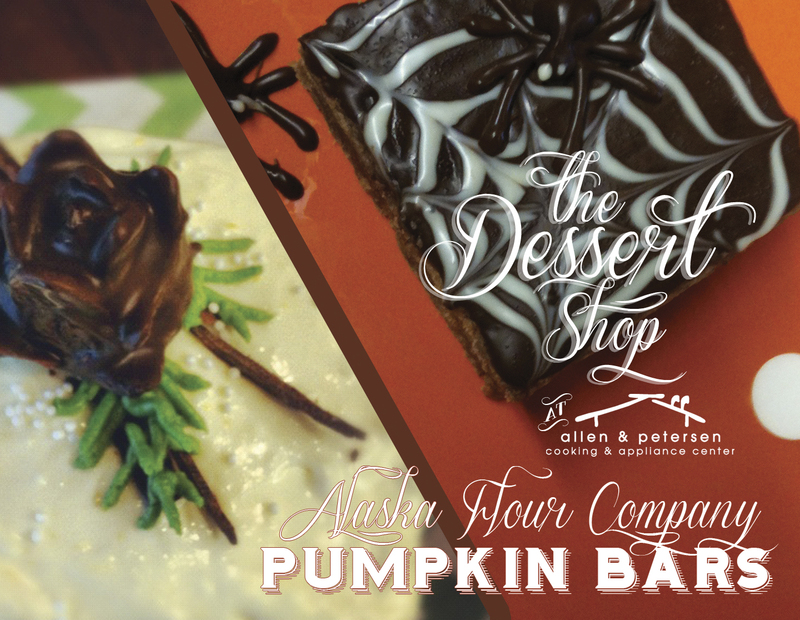 Alaska Flour Company has the best dessert recipes for their Barley Flour, so we borrowed one and made it, 2 WAYS. 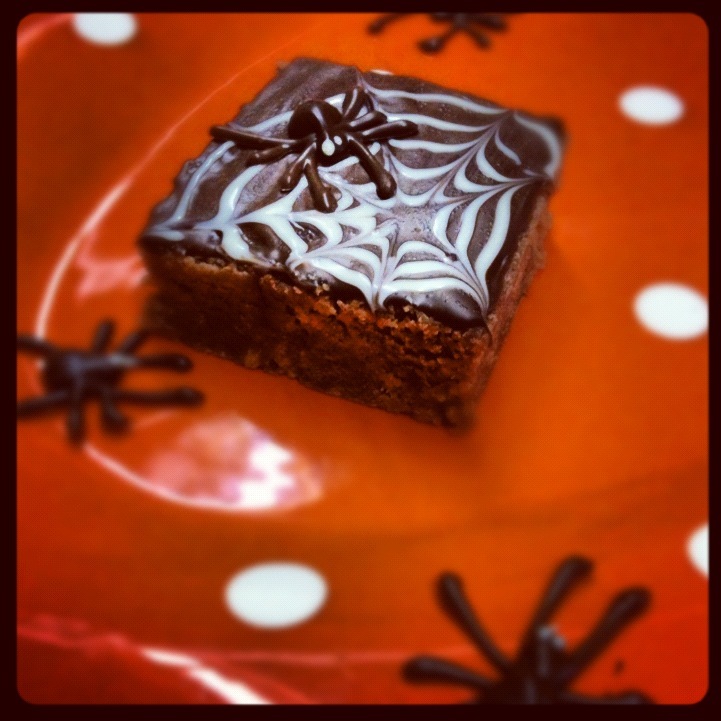 Because Halloween fell in the middle of the week, we decided to make these seasonal delights two ways to show how versatile a treat the bars can be. 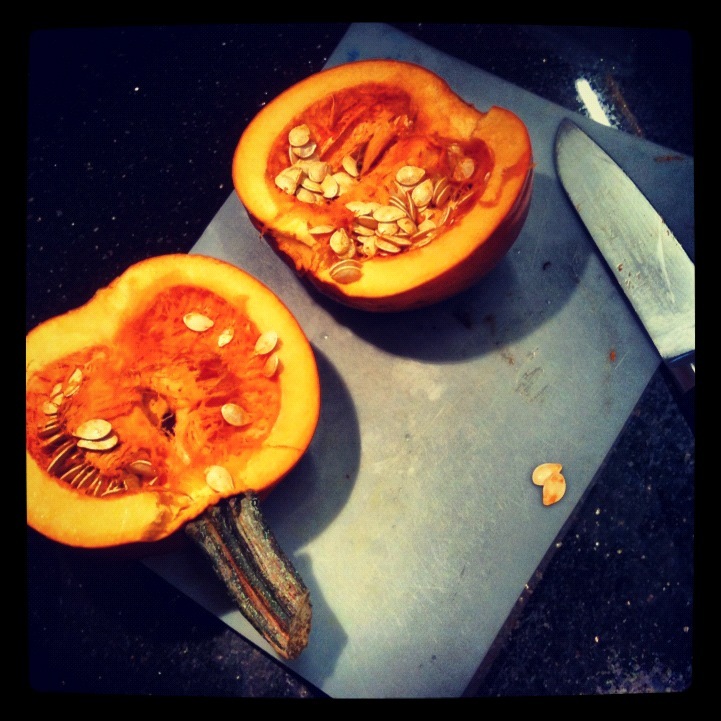 And now that pumpkin carving is over, pumpkin eating is in full swing!! 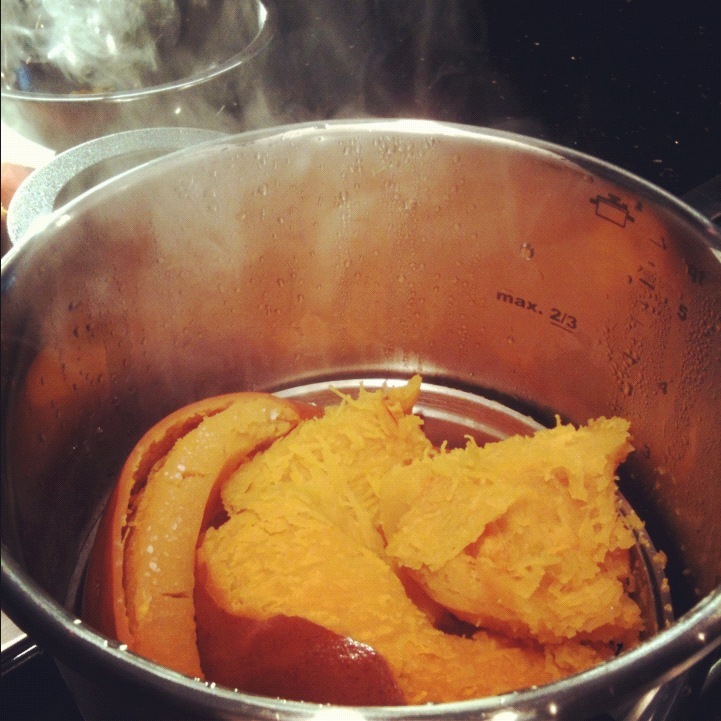 We wanted to use fresh pumpkin puree in our bars, and the BRK Pressure Cooker was just the tool to help us make our own in a hurry. It's so easy, and fast, and depending upon the size of your pumpkin, makes enough puree to freeze for future entertaining opportunities! 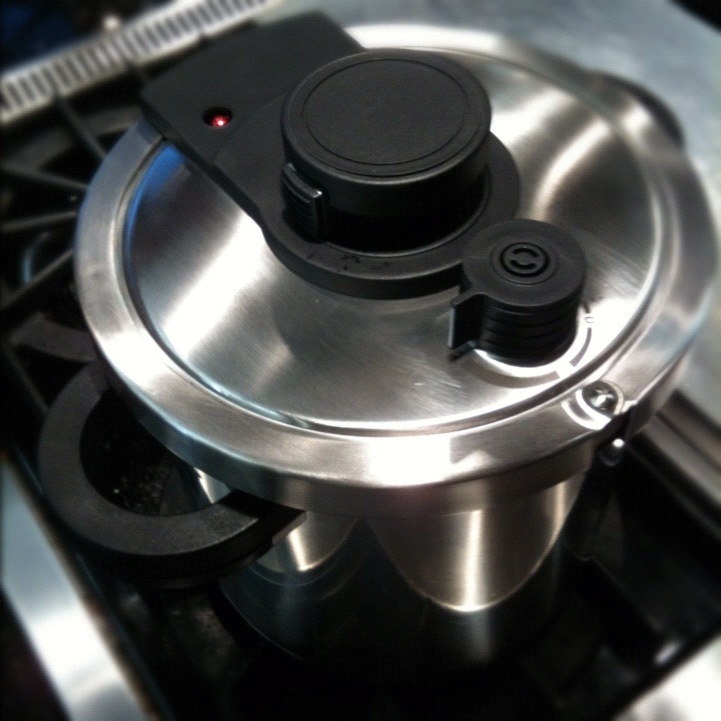 place the steaming basket in the bottom of the pressure cooker, add water and seal the top. Bring the cooker up to pressure as directed and cook for 5 minutes. Release the steam, and tahdah! 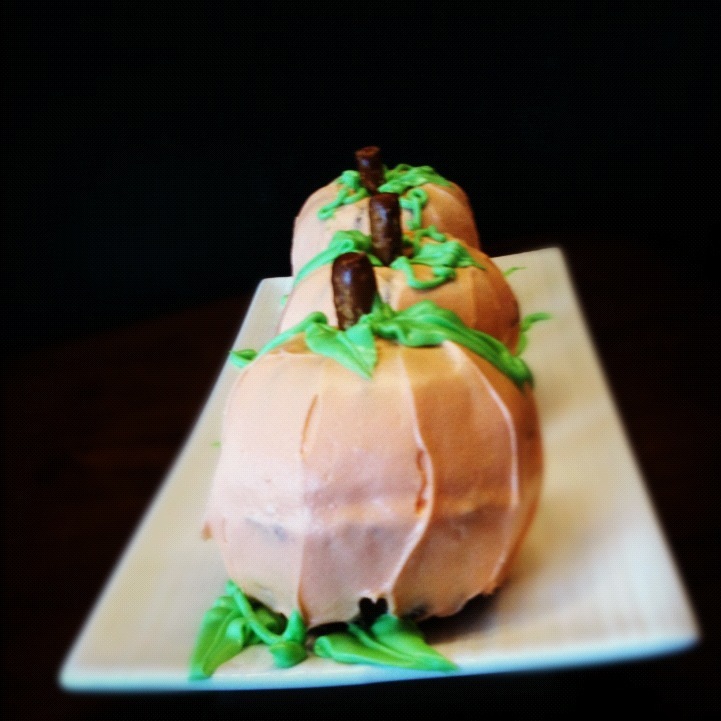 The flesh of the pumpkin should just fall out of the shell! 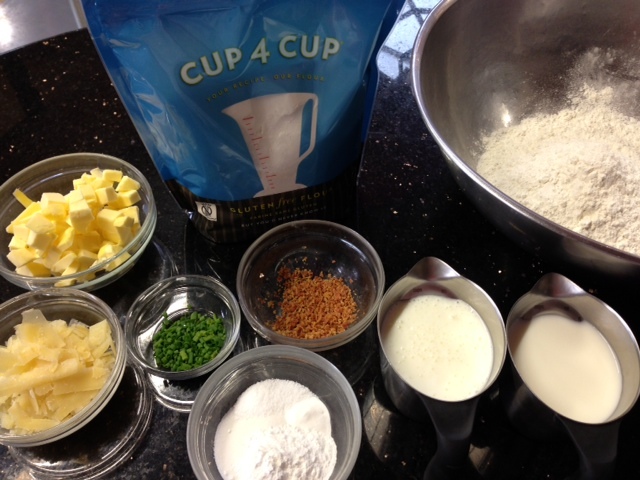 2 cups is all you need for each recipe, so we sealed up the rest in 2 cup portioned ziplocs. 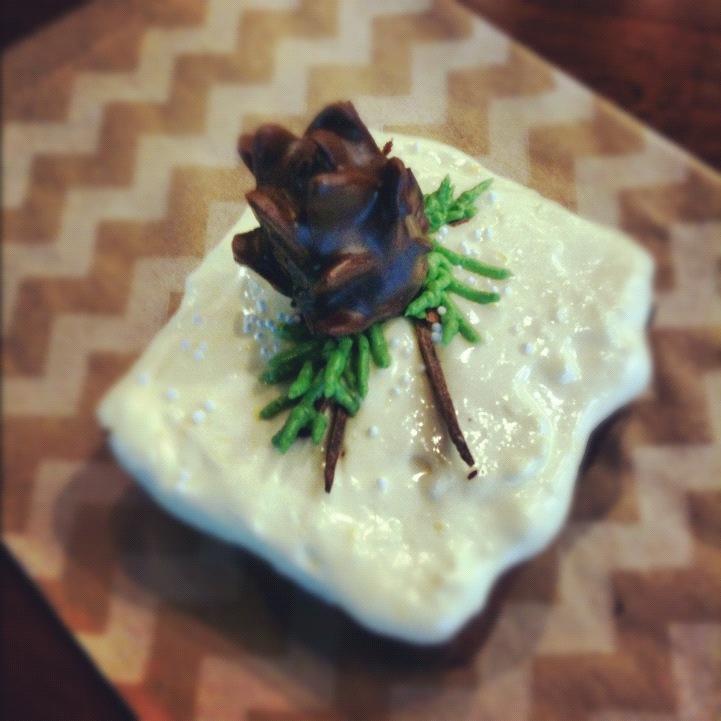 Depending upon how you wish to top your bars, plan ahead enough to be able to make either your chocolate spiders of pinecones prior to serving. Preheat oven to 325. Cream eggs and sugar. Add the rest of the ingredients in the order given. Beat until well mixed. Pour into greased & floured 9x13 pan. Bake 35-40 minutes. Check for doneness with a toothpick. 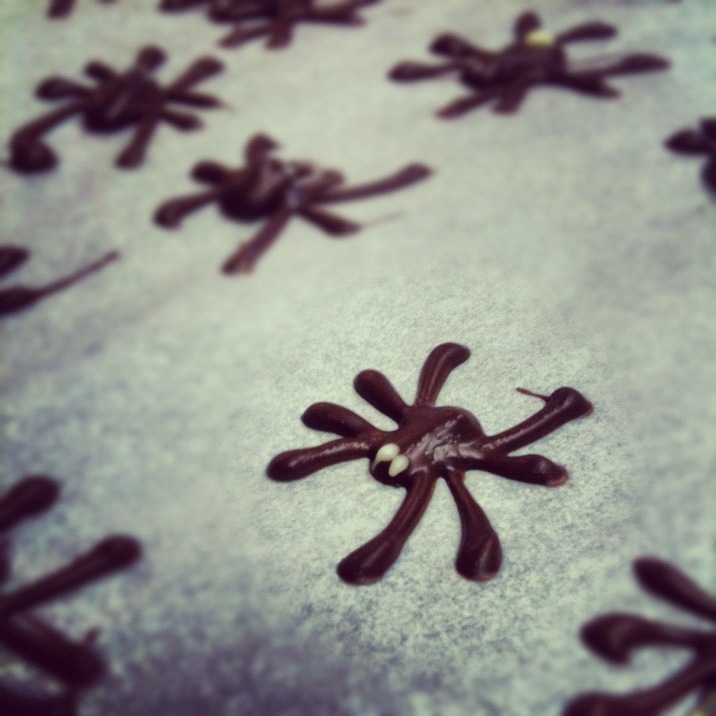 For spiders: Melt chocolate & fill piping bag fit with a small round tip. Pipe four sets of legs onto a silpat or parchment, pipe large circle for body and small circle for head. Optional: use white chocolate to pipe eyes onto front of head, or designs into abdomen. Chill in freezer until ready to use. 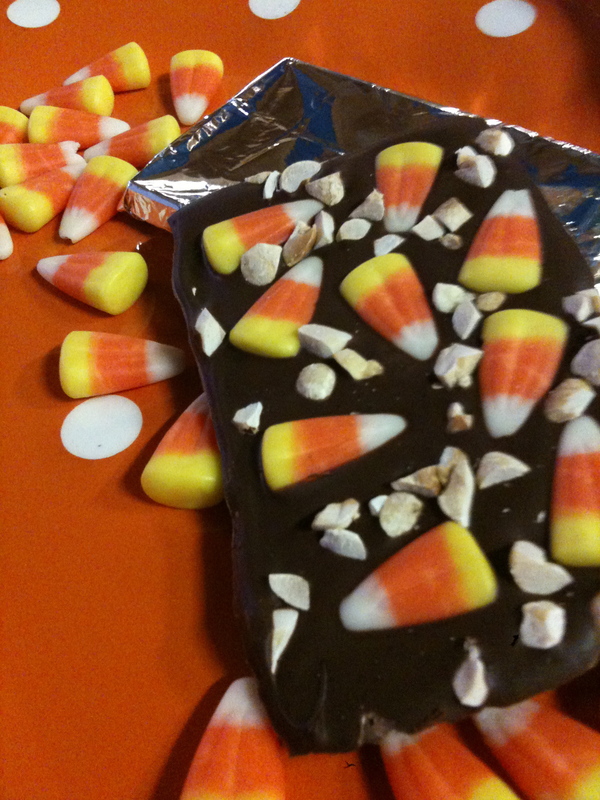 Alternate topping: Melt 1 C butterscotch chips & 1 C milk chocolate callets, smooth over top. Melt white chocolate callets and fill piping bag fitted with a small round tip. Pipe concentric circles on still melted top layer forming several ‘webs’. Using a toothpick or tip of a sharp knife, drag tip from center to last ring, radiating out, repeat 5-6 times around circles, spacing evenly to create web. Place spiders randomely amongs webs. Allow top to cool, use a sharp knife to cut and serve. For Chocolate Pinecones: Use left over cake, brownies or ganache truffle center, formed into a ball about the size of a marble. 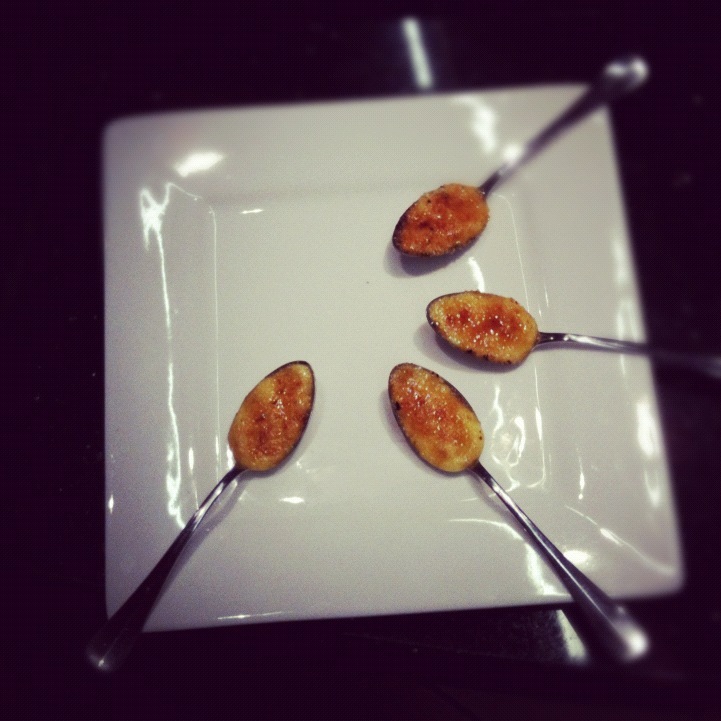 Press sliced almonds into the ball, starting with small pieces at the center top and fan out to bottom. Place in fridge to firm. 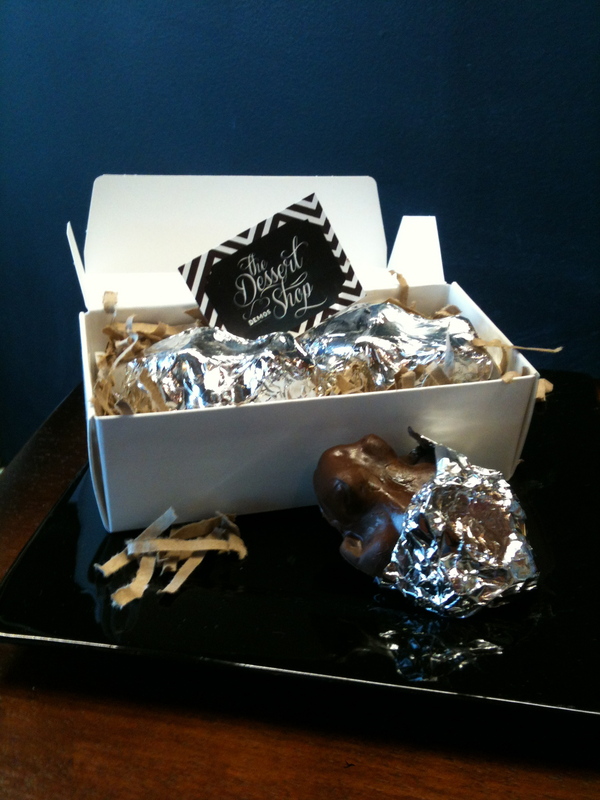 Melt dark chocolate, using a dipping tool, dip ‘cones’- submerging completely. Gently tap excess chocolate from the cone and lay to cool on a silpat mat. The dipping tools proved to be essential here, as circular one craddles the cones and allows excess chocolate to drip off, and the two and three prong dipping forks are perfect for scooting the cone onto the parchment and positioning it upright so that it can cool with out smashing one side. 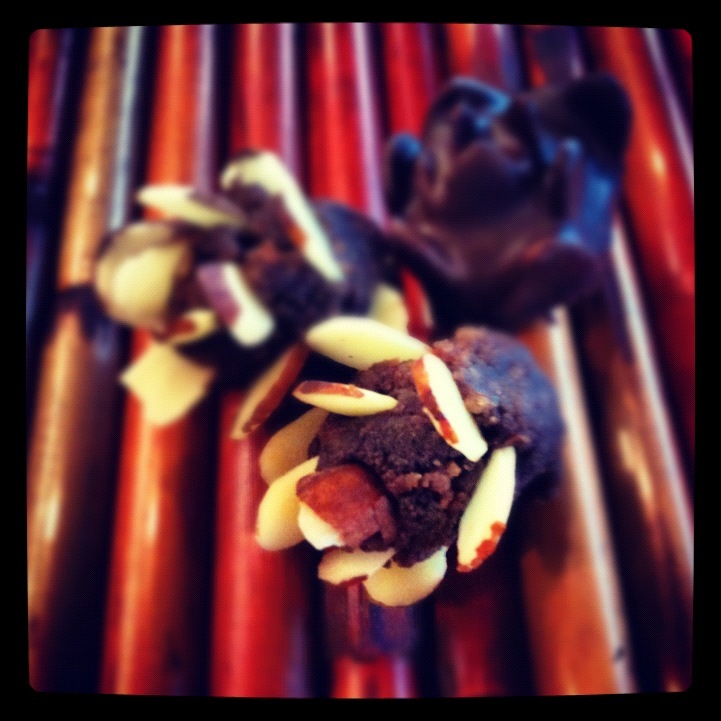 To garnish: lay thin mini pretzel sticks on top of frosted bars, or curl chocolate into ‘bark’. Pipe green pine needles onto stems, top with a pine cone. Dessert Shop Demo 2: It’s Cake Week! The purpose of the first few weeks of the Dessert Shop Demos is to present ideas, methods and recipes for treats and desserts that could be shared at a holiday party or served at home for entertaining- so, this week's theme in particular is CAKE!! 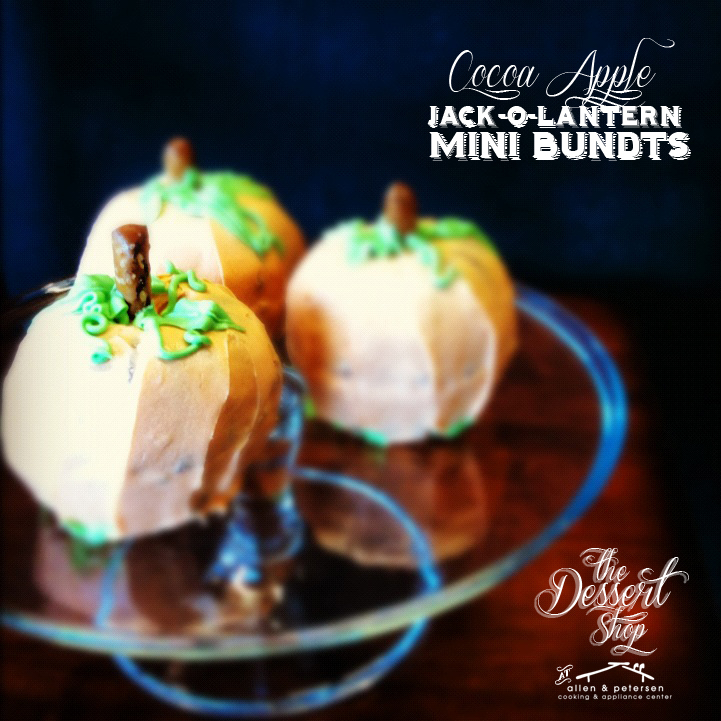 And since it's fall, we chose a blend of delicious flavors- and cooked them up in a seasonally relevant shape- hence the Cocoa Apple Jack-o-lantern Mini Bundts! This can also be done full size if you prefer to make just one- but be sure to chill your cakes enough to have a sturdy base before you frost. The recipe is a family favorite from our own staff, and legend has it- even earned it's share of blue ribbons at the Alaska State Fair! Core apples and slice into quarters. Process in a food processor, using the grater blade, set aside. In a large glass bowl, beat eggs, sugar, butter, and water until fluffy. In a separate bowl, combine dry ingredients and mix well. Slowly add dry mix to creamed mixture, stirring with wooden spoon until well blended. 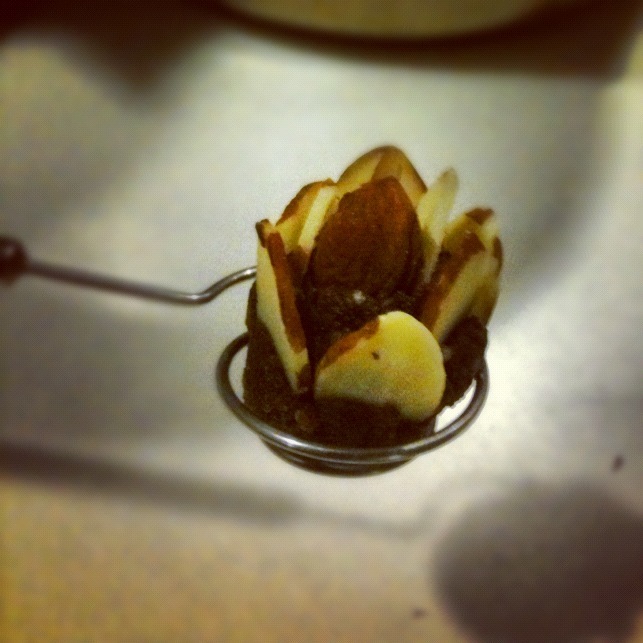 Add apple, nuts, chocolate callets and vanilla. Stir until all is combined. 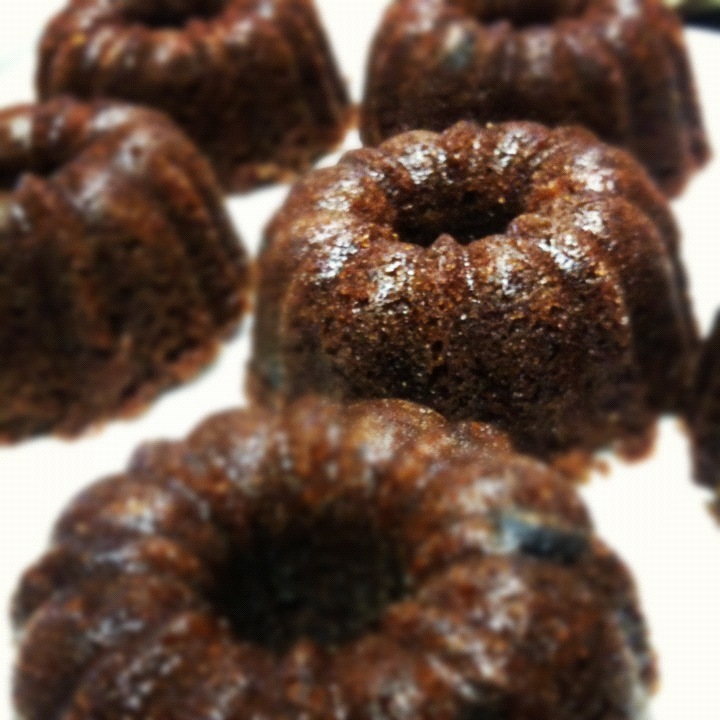 Scoop batter into Nordic Ware mini bundt pan, prepared with a coat of Vegalene spray in each cavity. Fill only 3/4 full, smoothing top with an offset spatula. Bake 325 degrees for 60-70 minutes- use a bundt cake tester to assure middle is cooked through. Remove from oven and allow to cool on a baking rack, 5 minutes. 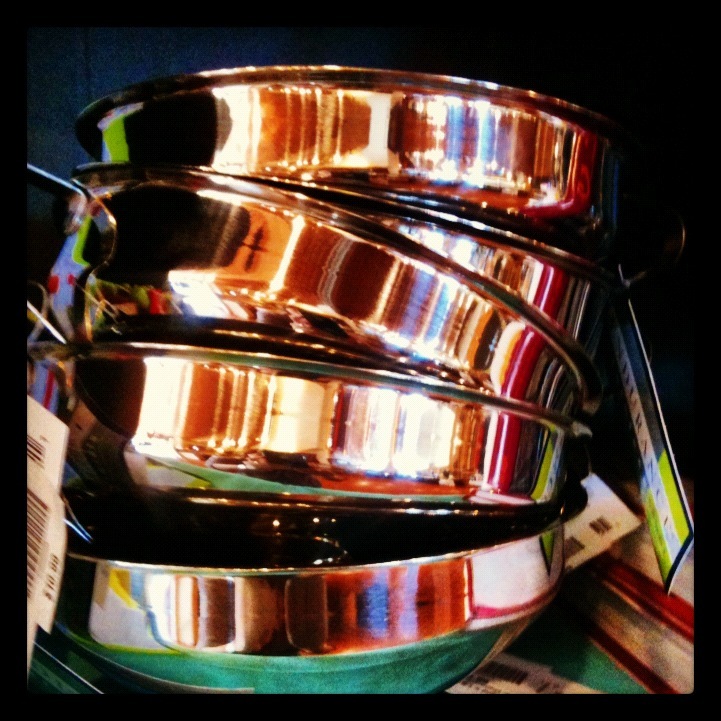 Place rack on top of pan, grasp handles against rack firmly, flip and gently shake until cakes release from pan. Allow to cool completely, trim bottom edge with a serrated knife for flat, stackable surface. Store in fridge up to 24 hours before assembly. Cream softened cream cheese, butter and vanilla until smooth. Add sugar one cup at a time, beat on high to combine. Flip one cake on its top, coat with frosting and top with a second cake. 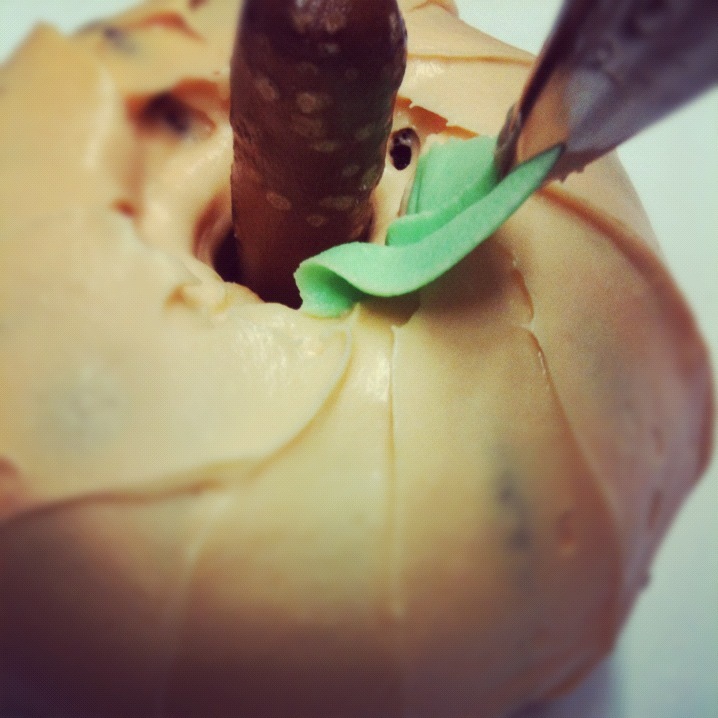 Frost outside of cake, smoothing from bottom to top to create 'ridges' with an offset spatula. Press a pretzel rod through the center, and pipe green vines and leaves at the base. 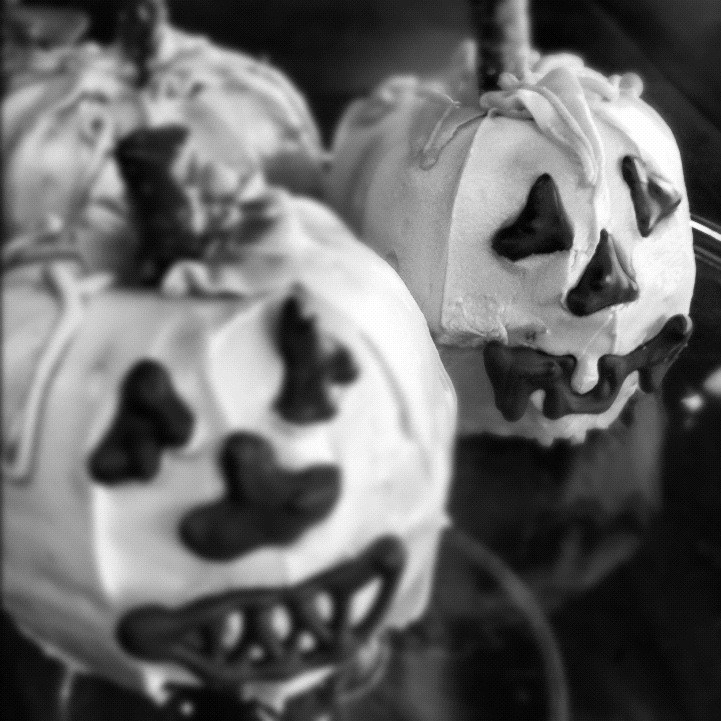 If desired, pipe chocolate faces on to parchment and allow to cool and press onto frosting, or pipe directly onto pumpkin surface. 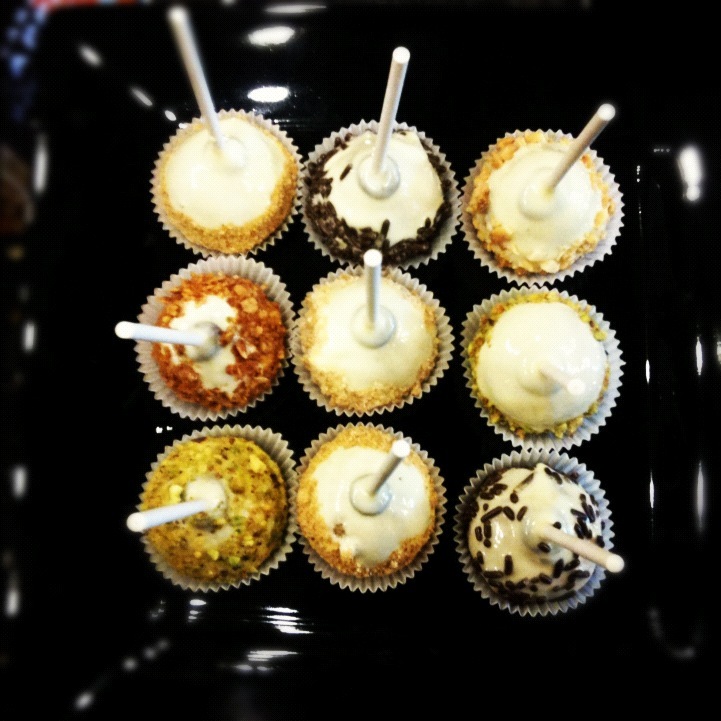 Spice Cake Pops with White Chocolate and Graham Cracker, Pistachio, Toffee, Granola, and or Sprinkle toppings. 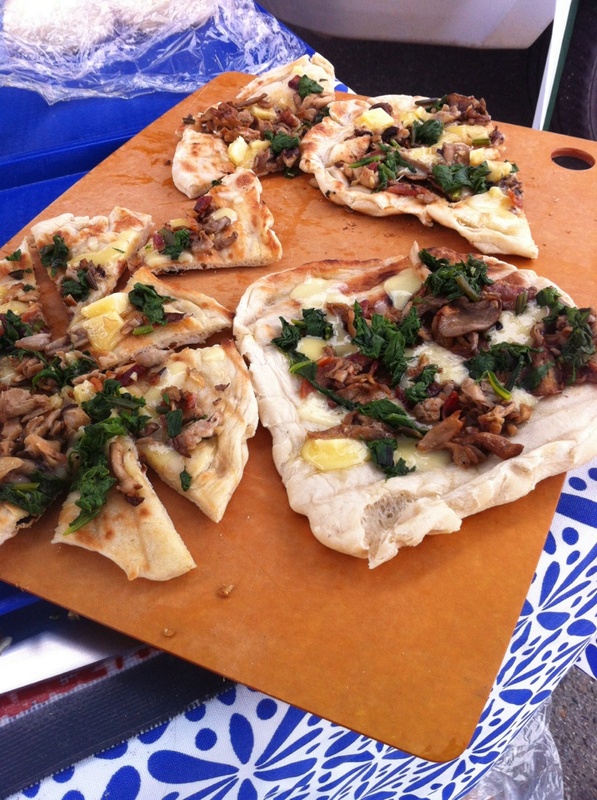 Chef Amanda took her flavors on the road to make a live-in-person appearance at the Saturday Farmer's Market , serving up delicious bites made with 'just picked' ingredients from the surrounding vendors. 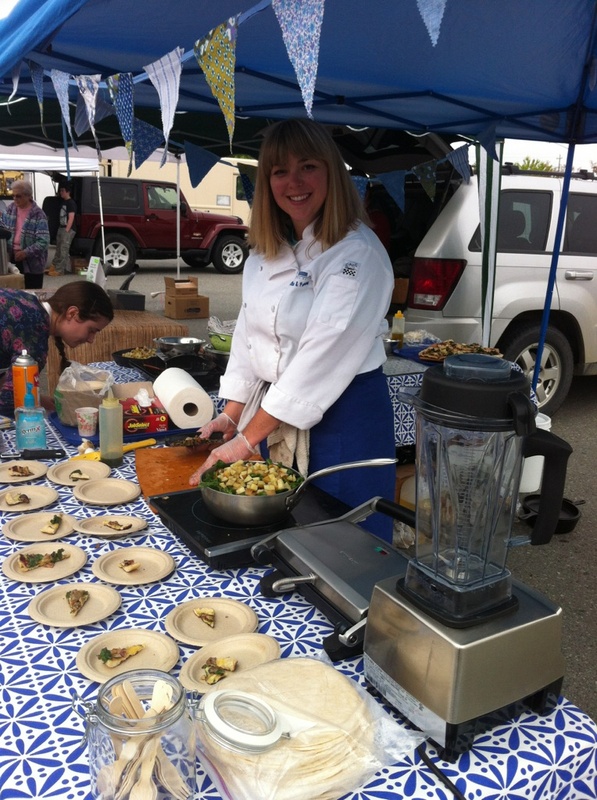 This weekend you can see her for yourself at the 15th and Cordova market where she'll be sampling her tasty omelets, grilled pizzas (featuring Alaska Flour Company's barley), and irresistibly fresh salads. Or, if you can't make it out, try her recipes for yourself at home! Thanks Amanda! 1. 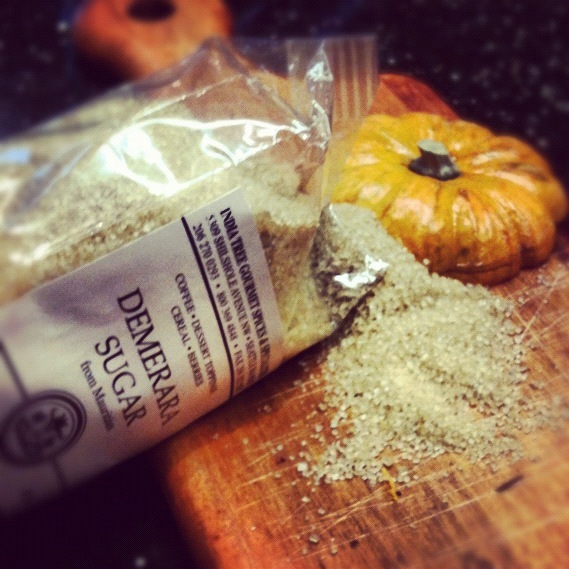 To make the dough: stir together the yeast, sugar, and warm water. 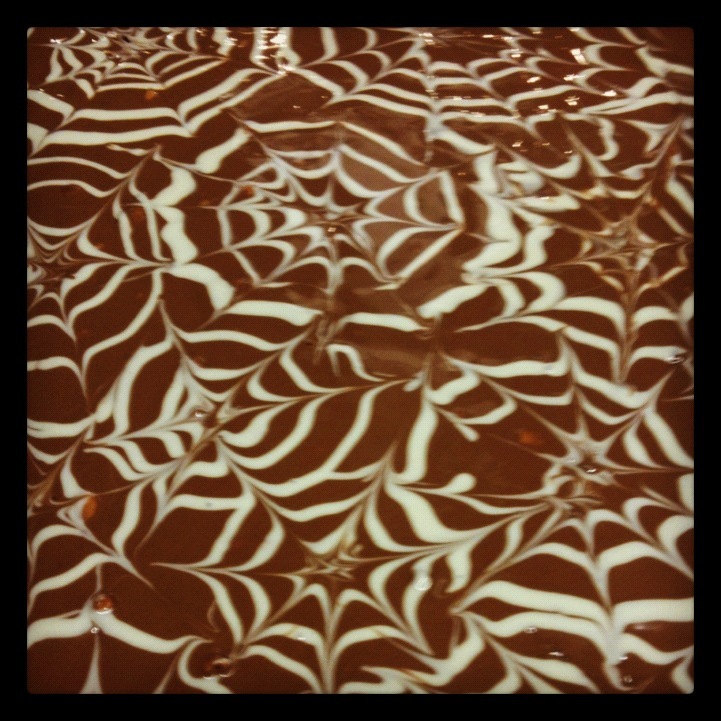 Let stand until the mixture becomes creamy, about 5 to 10 minutes. 2. 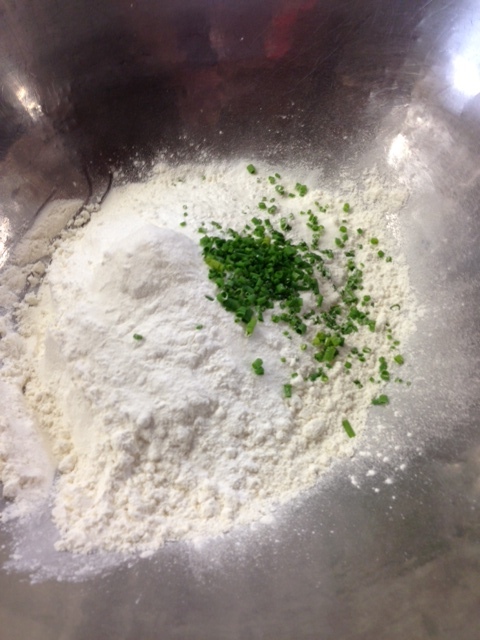 Combine the salt with the flours in the work bowl of a food processor. Pulse to evenly mix the dry ingredients. 3. Combine the yeast mixture, room temperature water and olive oil in a measuring cup with a pouring spout. 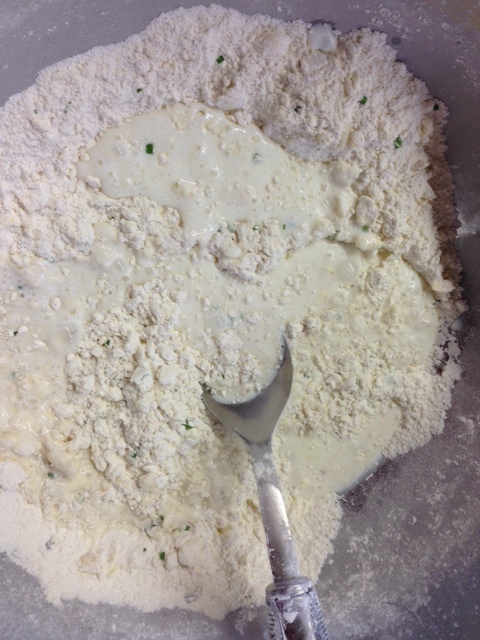 With the food processor running, slowly add the liquid through the feed tube; continue to process until the dough forms a satiny ball that clears the sides of the work bowl, about 1 ½ to 2 minutes. (Note: If after 1 minute the dough is sticky and clings to the blade, add 1 to 2 tablespoons of water and process until the dough forms a ball. 6. To grill pizza, allow gravity to stretch the dough into a round shape (hold in front of you and let it gently stretch, switching directions until done). Coat both sides with olive oil and place on a hot grill. After about 3 minutes, the dough will appear to be cooking and bubbly. Flip it over and add toppings, taking care to not add too many. 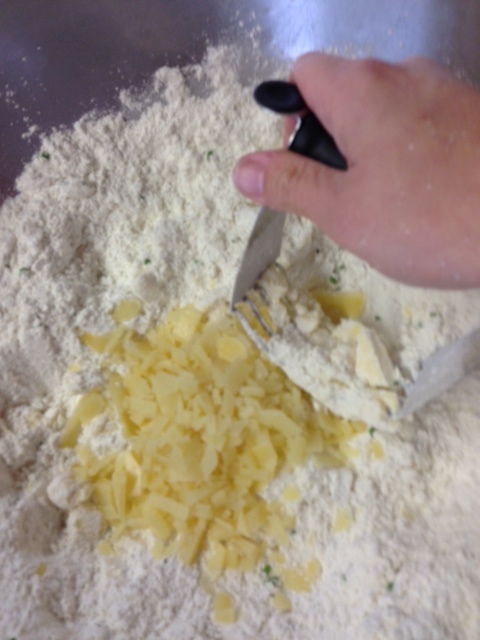 All toppings need to be pre-cooked and grated. Toppings included sautéed oyster and shitake mushrooms, caramelized onions and bacon, basil oil, and beet greens. Mix all together, taste, adjust seasoning as needed. Heat a pan up over medium-high heat. Cut the tofu into ½-inch cubes and blot with paper towels. When the pan is hot, add the oil and heat through quickly. Add the tofu cubes and sauté, coating all sides with the oil and getting even browning. Remove from pan and set aside. Combine all ingredients in a large bowl and toss. Serve on chilled plates and garnish with edible flowers. This is very unconventionally prepared, so feel free to adjust the preparation to fit your lifestyle. In a Dutch oven or in foil packets on a grill, cook potatoes and beets with oil, salt, and pepper until tender. Remove and spread out on a baking sheet to cool. Wilt the Swiss chard in a pan over medium heat. Combine all in the smoothie setting of the Vitamix and add water if needed. NOW, you are ready to toss the vegetables with the pesto dressing. I enjoy serving this salad on a toasted baguette slice like a bruschetta topping. Anyone can can. 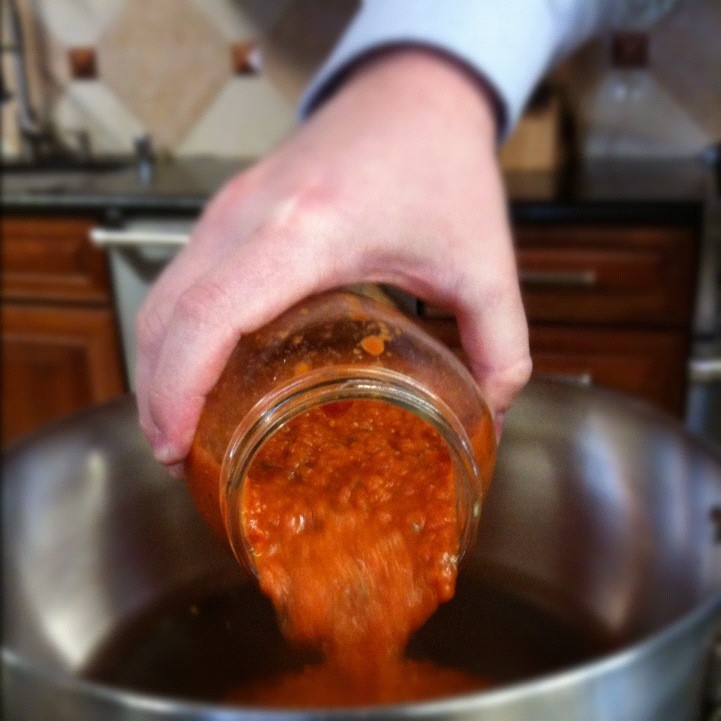 In fact, our very own Kyle D. has been boasting about his homemade marinara sauce that he is now making in large batches and jarring up. 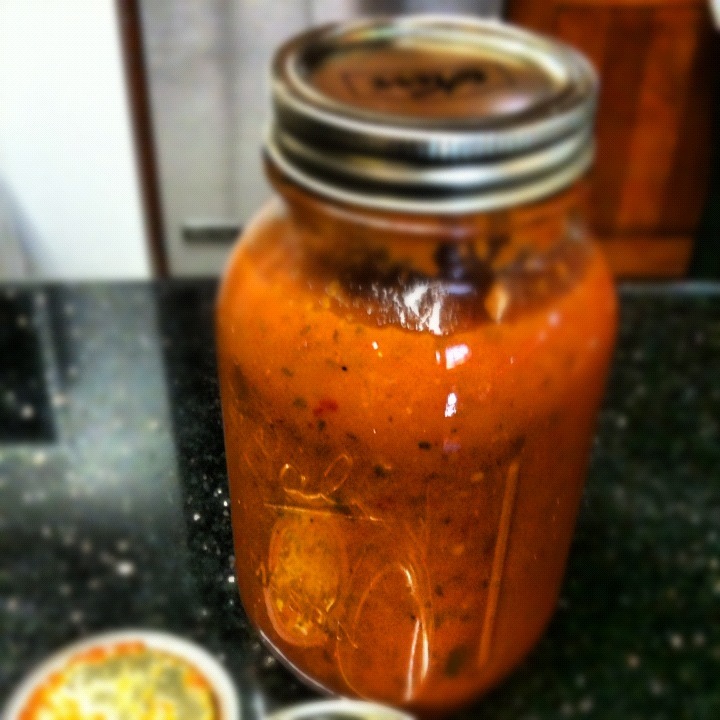 He not only has a delicious, home made sauce ready to go in the pantry, he also saves money on his grocery bill and cuts cooking time by using his pressure cooker to infuse the flavors. 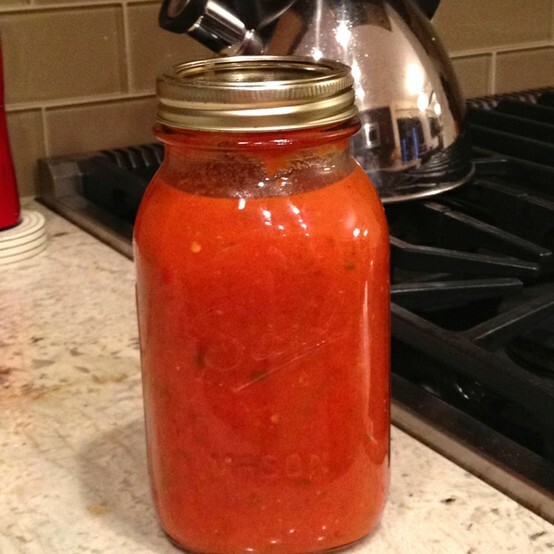 We convinced him to share his recipe with you - just be advised that Kyle likes it hot - but says you can scale back the crushed red pepper flakes to your taste. 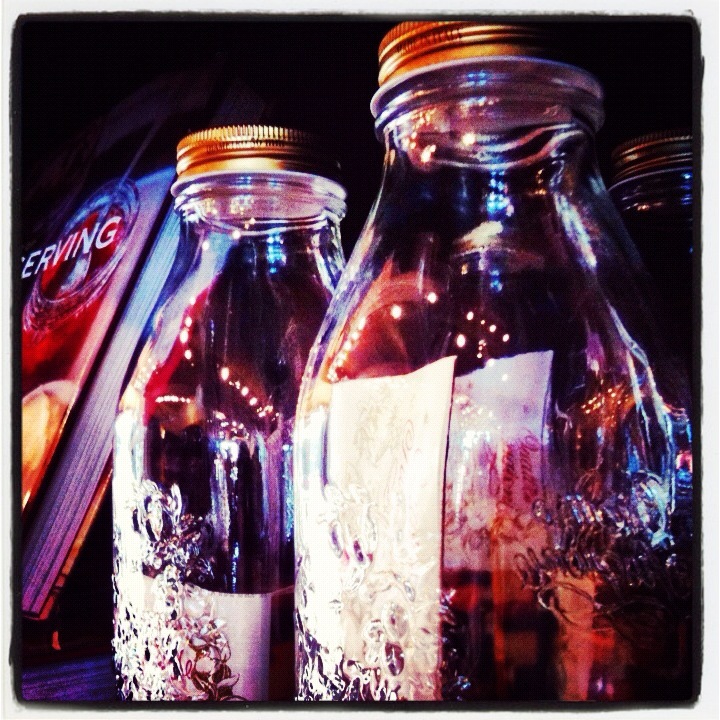 He even brought in a few jars for us to taste. 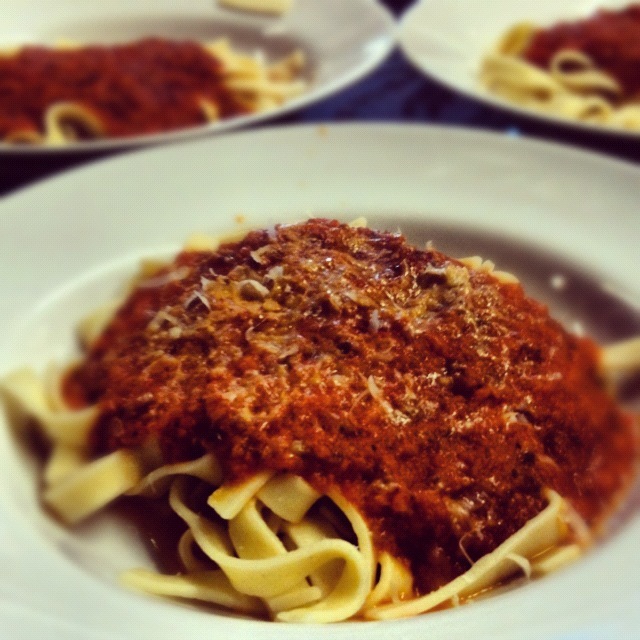 It's a special flavor, not diluted by pasta - which the majority of partakers rated as 'just right' on heat, with only one 'too spicy'- but for the most part the thing that sets it apart is the pepperiness that lingers with each bite. Lightly sauté the onions in olive oil in large pot for a few minutes. Add garlic and sauté another minute. Add tomatoes and bring sauce to boil, then turn heat to low. Add remaining ingredients, stir, cover and let simmer for one hour, stirring occasionally, or cook on low pressure in pressure cooker for 15 minutes. Emulsify to desired consistency. as well as funnels, lid lifters, labels, recipe books and just about everything you need to bottle up your big batch recipes.